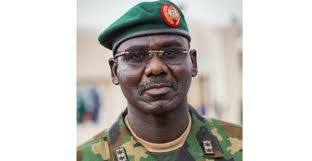 The Chief of Army Staff Lieutenant General Yusuf Buratai, on Monday visited the newly deployed troops of the 29 Task force Brigade at Benisheik and Gamdu towns of Kaga Local Government Areas of Borno State in north-east Nigeria. While addressing the two brigades, the Chief of Army Staff told the troops, who are “better armed and trained”, to defeat the Boko Haram, describing the insurgents as ‘ill equipped’. The Army Chief said the Nigerian Army had no excuse not to defeat the Boko Haram terrorists and assured the soldiers that they would get every necessary support from the government. He stressed that their deployment to the area was strategic to the success of the operation against the dreaded Boko Haram terrorists. “With the morale of the troops I have seen so far, you are good to go. I want to congratulate all of you for being part of this operation because Nigerians are watching and waiting for you to finish up these criminals called Boko Haram. “Your deployment here is strategic to the success of this operation and you have to be alert and focused at all times,” Buratai cautioned. The Army Chief assured the troops that all their logistics problems were being addressed and urged them to be loyal and obedient to their superior authorities without which no meaningful progress would be achieved. Lt. Gen Buratai called on well-meaning Nigerians to accord their utmost support to the Nigeria Military. He gave the assurance that the military was working hard to root out the militants from Nigeria. The Army Chief also visited the self-established Internally Displaced Persons’ camp located at Kukareta village in the outskirt of Damaturu the capital of Yobe State where he assured the displaced persons that they would soon return to their various homes. He said that the military was working hard and committed to ending the activities of the Boko Haram soon, as mandated by the President. In August, President Muhammadu Buhari mandated the military to end the activities of the Boko Haram, who have adopted suicide bombing as their means of attack, by December.